Brief Synopsis – After having a nervous breakdown and a crisis of conscience, an ad exec is sent to a psychiatric hospital where he realizes that the patients are the perfect people to help him write truthful ads. My Take on it – This is a movie that I saw while I was in high school and my friends and I thought it was so funny, we even managed to convince a teacher to show it to us in class during an end of year party. The premise is pretty silly, but the message of truth in advertising is clear. This is a rare film where the supporting characters stand out even more than the leads. 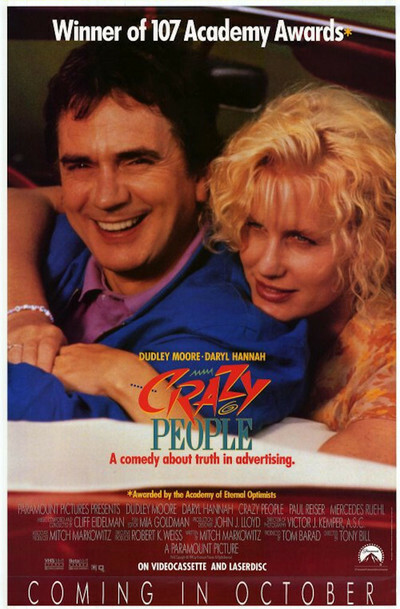 Darryl Hannah and Dudley Moore have absolutely no chemistry together but they are saved by the superb cast of supporting actors who each have their own quirks and give us some hilarious moments. I’d love to give an overview of each of the patients and their quirks, but it’s so much more fun to discover them by yourself. My favorites of the patients were the ones played by David Payner and Bruce Smitrovich. As I stated earlier, the plot isn’t very sound and you probably won’t remember much of the plot…BUT you will remember some of the ads created here because they really do personify truth in advertising and are hilarious! Bottom Line – Premise is a bit silly, but the ads created are hilarious. The characters are all quite memorable due to their different ailments. Great cast of supporting actors who play the patients. Moore and Hannah are both mediocre here tho due to a total lack of chemistry between them. Great message about truth in advertizing! Recommended!